Quite by accident, I got into the library business. I occasionally left topical reading materials in my hiker box during thru hiker season — an issue of Backpacker or Communicator — only to discover that missing the next time I checked the box and replaced with a different magazine or book. What was going on? So, I bought some construction supplies at my local Home Depot and created my very own little free library. 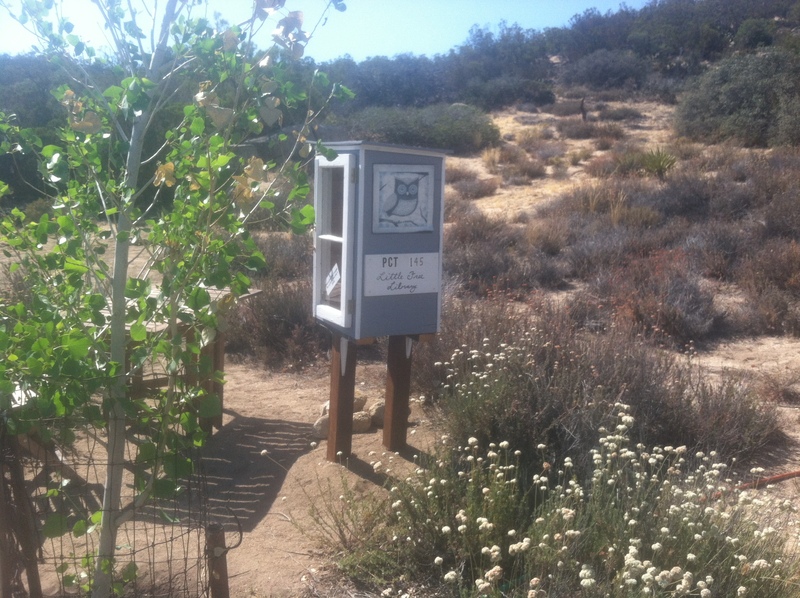 I christened it “PCT 145 Little Free Library” with the tagline “Books you don’t need in a place you can’t find” and got it registered with the LFL organization. It can be found on their “Map a Library” page if you search for it. (It is easiest to locate quickly if you search for Steward’s Name = PCT.) I initially stocked it with paperbacks I bought at a book sale held by my local library. In the meantime, I’ve come up with an alternate way to stock it with books that might be more relevant to PCT hikers. It was set up in time for the height of the 2015 nobo thru hiker season and has been a big hit, both in terms of the number of times it has been photographed by hikers and posted on their blogs and the number of books that have been exchanged. This is definitely something I’ll continue in the future. The Easter Bunny brings trail magic!